The past few weeks have been rather rough. My depression and anxiety symptoms have been rather bad. Though it’s mostly related to my psychiatric re-assessment and the plan to move out of the institution by May 1, these are not situations I can change. I also find it particularly hard to change my thoughts about them. All I can do is try to focus on the little things I do enjoy. Yesterday, I discovered the Liked and Loved linky. It is a beautiful way for people to share what they’ve liked and loved in the past month. Most people post about products. I will mention some of these too, but will also share the experiences that I’ve liked and loved. I therefore title this post “Rays of sunlight”. First, a product – or several. In early February, I ordered a box called the I Love Myself box at a little Dutch skincare store. It isn’t a monthly subscription box, but the surprise effect is similar. When you order it, you get a questionnaire that allows the store owner to get an idea of what products might suit you. 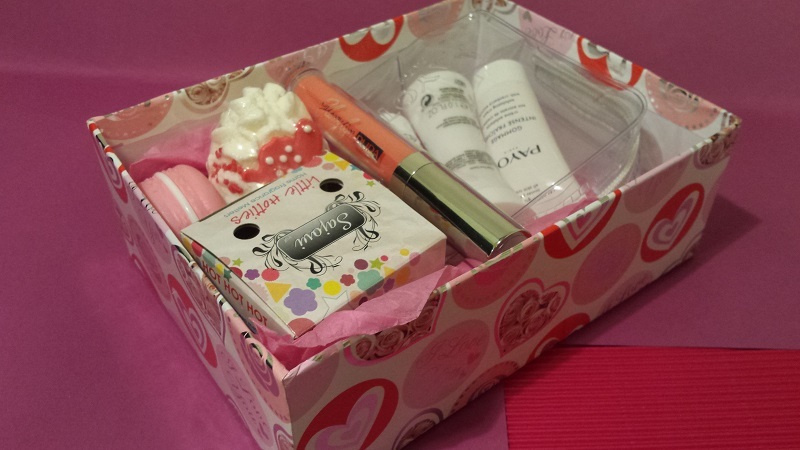 You then get a personalized surprise box of skin care, makeup, bath and related products. My box is lovely, though I haven’t yet tried out every product. I got a lip gloss with a lovely scent, a box of tiny wax melts (oh, how I love those! ), some facial care products, a hand cream and a bath bomb. I will need to bathe soon, as we don’t have a tub at home. My husband has been calling Saturdays “Pizzaturdays” and getting me pizza almost every week. In addition, a few weeks ago the staff at my unit got takeout pizza for those who wanted it and could afford it. There’s this pizza restaurant in the next town that I used to order a very spicey salami pizza from. The more I ate it, the more I disliked it and I couldn’t figure out why, since I thought I loved all ingredients. As it turned out though, there was anchovy on the pizza, which made it very salty. This time when the staff ordered from that restaurant, I decided to go for a regular salami pizza. For the first time in a few months, I made a melt and pour soap again a few weeks ago. I based it on this recipe, though I used regular white soap base rather than honey soap base and I skipped the bee pollen. I do have honey soap base too, but the staff member I made it for wanted me to use a white soap base and I couldn’t find my goat’s milk soap base. I also mixed in some gold-colored mica, which gave the soap a creamy color. I do know hwo to make real gold-colored surfaces, but the staff didn’t want me to do this. I loved the process, though the soap didn’t turn out as great as I’d hoped. That’s why I don’t have a picture. I finally had my first trial lesson with an iPhone three weeks ago. Blind people often need to have special instruction in using a smartphone, especially if like me they have no previous experience with it. The iPhone is more accessible than are Android phones, which is why I’m learning to use that. I managed the tapping and swiping movements surprisingly well. I will take one more trial lesson before I buy myself an iPhone and will start formal training. Yesterday, I was home for a day. It went okay, but not great. Because my husband wasn’t sure he’d be home in time for dinner, he asked his mother if I could eat there. My mother-in-law picked me up at around 5PM and we drank some coffee and then had dinner. It was nice. My in-laws have four horses. After dinner, my mother-in-law asked me whether I wanted to pet one of the horses. She led me to a horse named Bink, who loves to be petted on the neck. I have some experience doing day activities with horses, but those were tiny ponies and this is a large horse. I was excited and a little scared at once. The last two weeks have been great weather-wise. I have been doing lots of walking and sitting outside. Haven’t yet been in our garden at home, because yesterday I was afraid our cat would get outside and manage to get onto some roof. My husband and I did take a little tandem bike ride last week, which was fun. As regular visitors to my blog know, I am currently in the re-assessment process regarding my psychiatric diagnosis. Last year, my psychologist removed my autism diagnosis, that I’d had since 2007. I initially went along, because her reasoning – that I had some type of brain njury instead – seemed plausible at the time. Besides, I wanted to spare myself the emotional rollercoaster of yet another assessment. I had several since my initial diagnosis after all, though most of these reports disappeared. After my psychologist decided to diagnose me with just a personality disorder and depression though, I decided to seek an independent second opinion anyway. I’ve never had an assessment more thorough than this one, I must admit. I participated in the #AtoZChallenge twice already. In 2015, I had autism as my theme. In 2016, I went with general mental health. This year, I’m still in doubt even as I write this post. Brain injury, premature birth and disability rights crossed my mind, but I have a hard time thinking of topics for each letter that are relevant to these themes. Since I don’t know yet what the outcome of my re-assessment will be, I am rather daring by picking “neurodevelopmental disorders” again. This is broader than autism, so I can have an excuse and write on unrelated topics if it turns out I’m not diagnosable as autistic after all. Neurodevelopental disorders are still a major (special) interest of mine. However, I don’t know yet how I will handle the outcome of my assessment, so it might be I’ll be so depressed I’ll stop blogging. My blog has been rather inactive lately anyway. If it turns out I’m not diagnosed with autism, I’ll hopefully finish the challenge and then close the chapter. I contemplated skipping A to Z and choosing this theme for #Write31Days in October (if that challenge stll exists) should I be diagnosed with autism again. However, maybe my blog will have died of inactivity by then. In an attempt to kick it when it’s down, I’ll take on the #AtoZChallenge anyway. Wish me luck. Last week, I would’ve had my ten year Aspieversary/autiversary or the anniversary of my autism diagnosis. I did realize this and even started writing a blog post about it, but it didn’t feel right to celebrate an anniversary of something that no longer is. After all, I’m no longer diagnosed as autistic. I was also quite shocked when it dawned upon me that I’d been institutionalized for almost the entirety of these ten years. I then started thinking about the ten years before that and how much longer they seemed to have taken. Time flies when you’re getting old(er). I then started writing a post on the psychological evaluation that I had the day before my would-be-Aspieversary. That was hard too – both the evaluation and writing about it. For the first time that I had a psycholoigical assessment, the personality testing was in fact the easiest – or least difficult – part. I just can’t get past the fact that I did rather poorly on some of the neuropsychological tests and didn’t seem to score as great on the intelligence test. The neuropsych testing consisted of a couple of memory tests. Most went okay, but with one, I kept losing focus. Then there was a test for semantics, the way words and their meanings are formed and articulated. I had to name as may words starting with a given letter or in a given category (animals, occupations) in one minute as possible. In the animals category, I started blurting out donkey, squirrel and Brazilian wandering spider, which are three words I use repetitively, and then I got stuck. I don’t know what the average score is of course, but some of my staff tried this one and did much better than I did. Of course, they weren’t in an actual test setting. Then I got what I think is the verbal part of the Wechsler Adult Intelligence Scale. Older versions of this intelligence test consist of a verbal and a non-verbal (performance) part, but the performance part isn’t possible for me because I’m blind. The current version does not provide a verbal or performance IQ score, but it still consists of verbal and non-verbal tasks. I did okay and still seemed to have the same strengths (similarities, arithmetic) and weaknesses (compreheension) as when I last had an intelligence test twelve years ago. I don’t think I scored as mind-blowingly high as my parents would want me to though. When I told my mother so, she said I just don’t want to know that I’m gifted. I don’t know whether she meant that I didn’t try my best or that I underestimated my actual performance. I also got some tests that seem to be specific to autism. One of them was a kind of weird test that seemed to measure theory of mind. I heard these little stories and then had to say whether a character had said something inappropriate. Then there were follow-up questions abou thow each character would feel, whether they could know that what they said was inappropriate, etc. I got rather frustrated with this test. Some of the questionnaires also seemed to be relevant to my possible autism. One was some kind of systemizing/empathizing test. I once took a similar (or the same) test online and scored below-average on both scales. I mean, I am interested in systemizing, but I can’t actually do it right in daily life. For example, I can’t balance a checkbook, but I do take an interest in random strings of information, such as share prices (yes, I did at one point perseverate on that). There was also this test that asked about the ability to read one’s own feelings. This was a rather weird one to me, but that may be because I barely understand how anyone would be able to tell the difference between for example feelign excited and feeling enthusiastic. Lastly, I got a coping sytles questionnaire and several personality tests. I scored high on avoidance twelve years ago when I got the same coping styles questionnaire and I think that has only gotten worse. After all, all I’ve learned in the mental hospital is to distract or take a tranquilizer. This is the worst coping style according to my college psychology professor. I did okay on the personality tests. I mean, it’s likely I have at least some personality disorder traits, but that’d show in my behavior too anyway. A week has gone by since the psychological evaluation. My husband had to fill out another questionnaire about me again over the week-end. It was some kind of executive functioning questionnaire and I felt rather awkward at how many boxes my husband ticked. I also got a call from the student doing the evaluation on Monday with one more questionnaire. It seemed to be the other half of the systemizing/empathizing thing. I got to do that over the phone. The student also asked for my E-mail address, so that the psychologist could contact me regarding some questions and concerns I had written down and taken to the assessment. I have mixed feelings about the possible outcomes of the assessment. I mean, I don’t even know whether I want to be autistic after all. Of course, you’d think, most people wouldn’t choose to be autistic over neurotypical. That’s not what’s at stake here though, since I won’t change neurotype if the psychologist diagnoses me one way or the other. I still think I need the validation that my impairments are real. Realizing these impairments makes me feel a little inferior to the people I love, and in that sense, it’d be great if I made them all up. Of course, that may be internalized ableism.